Tall stories told by newspapers and their reporters generally don’t start wars. But they do justify them in advance. Afterwards they protect the officials who start them from being prosecuted for war crimes. On August 5, 1964, there was no truth in President Lyndon Johnson’s claim – reported by every major US newspaper – that there had been “open aggression on the high seas against the United States of America” by North Vietnamese gunboats in the Gulf of Tonkin. That’s because the US Navy destroyer Maddux had been inside North Vietnam’s territorial waters to pinpoint shore targets, after US and South Vietnamese naval vessels had opened fire on North Vietnamese islands in the area several days earlier. The August 4 reports of a gunboat attack on the Maddux “appear very doubtful”, according to a secret cable sent by the Maddux commander to his headquarters at the time. In retrospect, all the available evidence indicates that no attack took place. What is certain, however, is that the fiction was good enough for Johnson to get the US Congress to enact the August 7, 1964, resolution giving the US administration the warrant to start a full-scale invasion of Vietnam by US ground forces. The outcome is well-known. The US was defeated in that war. About 50,000 US soldiers returned in body bags, and about 3.8 million Vietnamese (10% of the population) went prematurely into the ground. Forty years later, more than 600,000 Iraqis (2%) died as a result of the Anglo-American invasion of Iraq in 2003. That war was advanced by claims about weapons of mass destruction and then-President Saddam Hussein’s plan to use them, which were reported as true by the leading Anglo-American media. We now know the evidence to have been fabricated, and the reports to have been false. We also know that the government officials in London and Washington, who launched the war in Iraq, knew them to be false when they were egging reporters on to publish them. We also know the number of combatant and collateral deaths that resulted in Iraq has been reduced to a fiction of a fraction. This month we are going to war against Syria and another half-million dead would be a fair bet (2.2%). 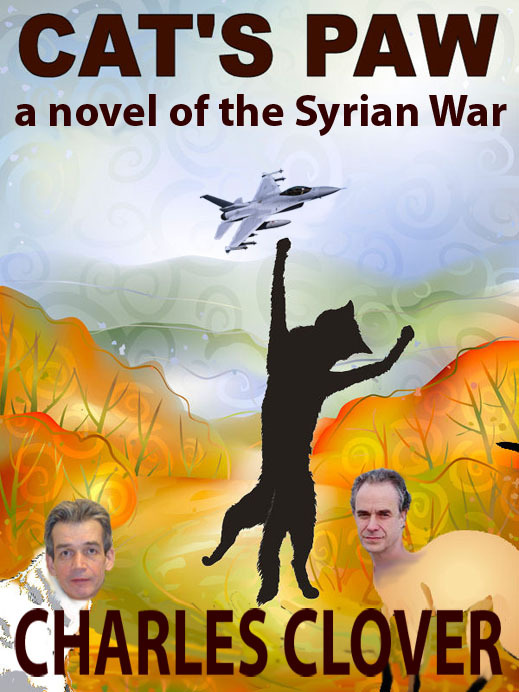 The reporters who connive in the fictions to warrant foreign military operations against that country, and have stoked the Syrian war to date, are cat’s paws, just as their predecessors were in the Vietnam case, and in the Iraqi one. Come to think of it, it dishonours the intelligence of the feline species to associate the furry mitt with manipulative lying on the scale now being practised by the human species, for whom the records and the lessons are so recent, so obvious. Cats aren’t so unlearning or meretricious. In the case of the war against Syria, neither are the Russians nor the Chinese. So in the Syrian war-rooms of London, Washington, Ankara and Riyadh, there is a branch of operations whose purpose is to discredit whatever the Chinese and Russians have to say, or do, in opposition to the war of the month. Their ancillary purpose is to use the press to deter and cut off shipping of supplies for one side in the Syrian war while assuring the escalation of supplies for the other side. The jury is still out on whether low-quality journalism is proportionally less costly in investment or copyright, especially when it may be camouflage for war crimes. Readers who click to read are urged to make their own calculation of what these reports are worth – in terms of war operations, and equally in terms of truth value. Several times over, Clover reports there are mysteries about the attempted shipment of helicopters from Russia to Syria on board the MV Alaed. But he omits to refer to comprehensive research, prepared in Europe and the US, which clarifies a great many recent arms shipment reports, including those to the Syrian insurrection forces, as well as US shipments to the Egyptian military. The report by Sergio Finardi of TransArms Research in Chicago and Peter Danssaert of the International Peace Information Service, Antwerp, is entitled Rough Seas, Maritime Transport and Arms Shipments.It carries an issue date of July 12, but appears to have been published several days before. It runs to 84 pages; pages 68 to 74 cover the MV Alaed, leaving none of Clover’s mysteries unsolved. Read it in full here. Since Clover’s Russian target, shipping company Femco, owner of the MV Alaed, posted the excerpt on its voyages from the Finardi-Danssaert report on July 11, it is difficult to believe that Clover could have missed its significance. If he didn’t, he must have decided to ignore the Finardi-Danssaert evidence. Clover began the preparation of his story on the MV Alaed on or just before July 5. That’s the date on which Femco reveals it received an email from Clover asking questions about the vessel, its cargoes and voyages, and the relationship of Femco to other Russian companies, including the state oil company Rosneft and the state tanker company Sovcomflot. Femco published Clover’s questions and its answers on July 13. Here is the full 7-page text. According to Clover, “the confusing and contradictory announcements about the Alaed and the Russian fleet illustrate either a well thought out disinformation strategy, or total confusion and chaos about the objectives of Russia’s Syria strategy.” Readers are invited to join the PAW nominating panel to judge whether that’s also the conclusion they draw after reading the TransArms report and Femco’s responses. For background on Voitenko (left image), the PAW nominating panel invites readers to go through the maritime mystery of July 2010, when Voitenko claims to have been forced to flee Russia for Thailand, hotly pursued by agents of the Russian secret services. At the time, he claimed, this was on account of his coverage of the disappearance of the Russian lumber carrier, the Arctic Sea, after being boarded off the Swedish coast in the Baltic Sea. Even if Voitenko’s claims were inventions or hoaxes at the time, at the very least Clover reports the welcome news that Voitenko’s expert insights no longer put him at risk of his life or at deprivation of the comforts of his motherland. His insight on the role of mind-altering drugs in Russian maritime policy-making is endorsed by Clover in the last line of the FT’s coverage. 1. Is the transcript of your Q&A with FEMCO, as published on the latter’s website, accurate and unabridged? 2. On what evidence from the Arctic Sea episode, and subsequently, do you rely for terming Mikhail Voytenko “an expert on the Russian Navy and shipping industry”? 3. From your July 13 report you omitted to identify the measures you and your colleagues took to check Mr Voytenko’s claim, reported as the conclusion of the story and also your conclusion, that “recent moves of Russian authorities can’t be explained by any other sensible reasons except drugs and alcohol influence”? Your two reports have been nominated for the second Cat’s Paw award for 2012. Details and conditions for the award can be found here. Should you decline to respond, you may be reported as refusing to do so.